I love espresso. I love Fiat. But do I love them both enough to option the in-car espresso kit on the new Fiat 500L. Expected to arrive in the U.S. beginning next year, the 5 passenger 500L offers an integrated Lavazza Coffee Experience Kit as part of its option package. Although the decision to offer the in-car espresso kit to the American market has not yet been made, it will be available to European buyers. 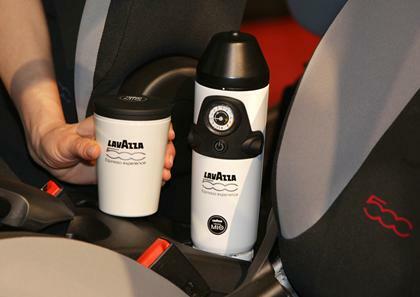 The kit promises a fresh brewed true Italian espresso made in vehicle, no barista required. Coffee loving motor-heads like the idea of having an “espresso to go” but those concerned about distracted driving think that this is taking convenience to the extreme. Fiat representatives report that the system could be used only when the car is stopped and that the machine has a docking station in which the system remains locked. To brew or not to brew may be the question the next time you’re out for a drive in your new Fiat 500L where we’re told the L stands for long . . . not Lavazza. 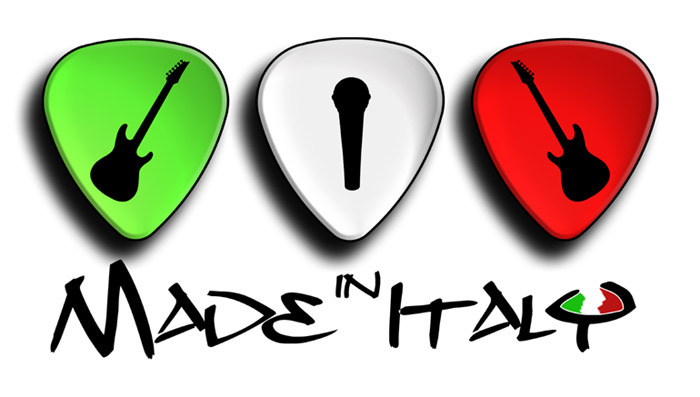 Here are a few songs from my Italian inspired playlist. They immediately bring Italy home for me in one way or another and once I’m on the plane to MXP (Malpensa in Milan) I plug into to the first one on the list and I’m on my way! From the multi-colored CNBC peacock to the bluebird Twitter logo, distinctive brands are associated with distinctive colors. If you happen to be in a café in the Marche region of northern Italy that color might be orange as in the bright orange straw of Pupillo Antonelli. Billed as the “original coffee mousse” the drink has a unique taste somewhere between ice cream and a drink. Served in a footed glass emblazoned with the words “il vera crema caffe’– Pupillo Antonelli”, the texture and flavor of this drink is based on an old-style homemade recipe for a creamy sauce with coffee. Re-invented in 2002 by Simon and Sandro Antonelli it has become a coffee cult favorite. A cold espresso-tinged cream with a texture like a smoothie or slush, its distinctive flavor and taste is best savored through a straw – an orange straw. Because nothing says notice me like the color orange. 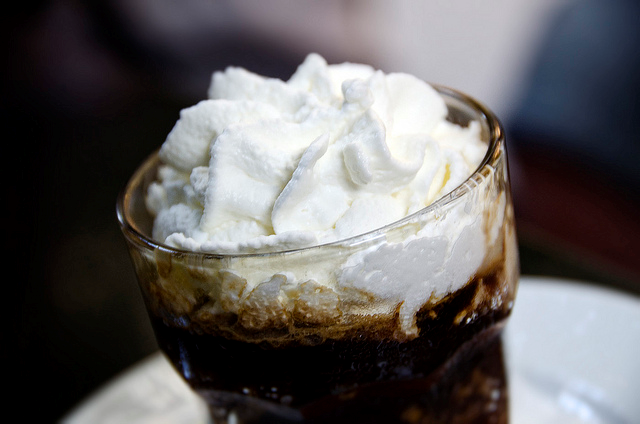 Granita al caffe’ con panna. What could be better than a frozen shot of espresso on a hot summer in the city day? When the temperature soars I like to have my morning espresso in one cool, heat-dissipating shot. A granita is a semi-frozen dessert made from sugar, water and flavorings, kind of like a slushy, sophisticated snow cone. The technique for making a granita is super easy; all you need is a casserole dish or shallow pan, your freezer and a fork. Flavorings are limited only by your imagination and in this case I’m imagining un caffe’ so I’ll stir coffee and sugar together (about 1/4 cup of granulated sugar for every two cups of brewed espresso or strong regular coffee) let it cool, then pour the coffee mixture into a shallow dish or pan and put it in the freezer. In about 20 minutes to half an hour, it should start to freeze. Break it up with a fork, and leave in the freezer. Do this again in another 20 minutes and continue until there is no more loose liquid in the mix. Serve in a glass dish or cup with a good amount of panna (whipped heavy cream) on top. The great thing about this recipe is easily adaptable to your taste and lots of slushy fun.